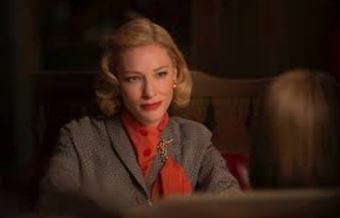 I was disappointed in my response to “Carol” the highly touted lesbian love story derived from one of my favorite lesbian authors Patricia Highsmith. I felt not swept away by the film as a whole, which I should’ve been. Being out and gay myself all my life, THIS seemed to be a movie meant for me, it’s target audience. It didn’t play at Toronto, which tipped me off that something was up.And the Weinstein Co. kept me, a major Oscarologist, away from this Oscar-seeking film. Rooney Mara won Best Actress at Cannes. What was missing? I think it was Rooney Mara’s performance. Playing a young, innocent (? )”from another planet” as Carol describes her, she seems cold, asexual. The Sapphic sensibility is just not there.The film was directed by a man. Maybe that’s the problem. 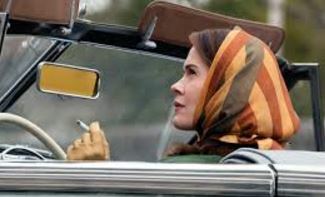 But it IS there in the performance of Sarah Paulson (ab0ve) as Carol’s ex-lover. You get an astounding sense of past history and love lost between the two women, that you never get from Cate the Great and Mara. And Cate IS great in this movie! She’s just magnificence personified. 1950s movie star to the max, she seems to just REEK of sexuality and sensuousness and glamour. It is a stunning performance, maybe Blanchett’s best. She just floored me. And Rooney Mara just well, didn’t. The great Ed Lachmann’s amazing cinematography swept me away, in a way the Mara’s Therese Belivant, didn’t. Filmed in, of all things, 16 mm. and in CINCINATTI(!) the period style is exactly right down to the tiniest detail, and Blanchett’s costumes by the great Sandy Powell, and her golden, perfectly coiffed hair and make-up are swoon-worthy. She just radiates a heat that makes men AND women fall in love with her. She’s beyond brilliant in this film. And she’s the one in dire trouble. She’s married, you see, and it’s 1952 and her husband wants to take her beloved little daughter away from her because she’s “abnormal.” So that part of the film is totally believable and fine. And disturbing. And true. But don’t get me wrong. I loved Rooney Mara before. She was very exciting in both “Social Network” and the American version of “The Girl With the Dragon Tattoo” for which she rightly garnered an Oscar nomination. So I was rooting for Rooney, and god knows, I was rooting for “Carol” to be a lesbian “Brokeback Mountain.” But it isn’t. And I’m not a gay woman so perhaps I can’t say that. But I am. Expectations were so high for this film, and the raves out of Cannes where so great, I guess I was bound to be disappointed. A “Brokeback Mountain,” it’s not. “Carol” is just strangely hollow. Cate is great, the cinematograpy, set design and costumes are off the charts. But the LOVE is missing.They have no heat, no chemistry. It’s not even gay, particularly, except when the superb Sarah Paulson shows up. SHE should get nominated for Best Supporting Actress. THERE I’ve said it. But the Tom Toms are beating for Rooney, and probably both she and Blanchett will end up in the Best Actress races that are upon us. Cate Blanchett is just a genius of an actress. But Rooney Mara is well, just OK. And in something as sumptuous and important a gay film, as “Carol”, well, she should-be better. The picture at the top of this article says it all, I think. (see above} Cate as Carol is front and center and Rooney Mara, well, we see the back of her head. Which in “Carol” is as expressive as the front of her head. Thanks. I really agree with your review. There was no heat, plus, I found Therese to be a somewhat sullen character. She isn’t interesting & her budding photographer talent feels tacked on. If she didn’t have that she’d be nothing but young & beautiful, which is a lot, but not enough. Rooney Mara gave a marvelous performance as Therese, a young woman who, probably for the first time, experiences attraction for a woman. She completely showed the discomfort she was feeling about her relationship with Richard. When Danny kissed her at the office, the discomfort Therese felt was evident. I think scenes that could have revealed more about Therese’s not fully understanding her feelings toward Carol, we’re cut from the film. Did you read the book? The screenplay DID NOT include a lot of what is it the book. In my humble opinion, Phyllis Nagy wrote the screenplay from her interpretation, with a lot of changes. There wasn’t a lot of dialogue for Therese. Rooney Mara performed this character basically silent. Her expressions were superb, displaying the, “I like what I see, but don’t know what to do about it”, feelings she was experiencing for the first time. I can go on and on, but, as beautiful as the screenplay is, it left very little to really display Therese’s inner self and what she was really feeling. Carol’s turmoil was obvious. 5 stars for Rooney’s performance. One has to be blind not to see the stunningly subtle, exquisite performance by Rooney Mara and the love, the chemistry between the two women. If Rooney is cold as Therese, then the author of this review must’ve watched some completely different movie, not Carol. And yes, the novel is much richer than the screenplay, no matter how beautiful the screenplay is. I am sorry this movie did not speak to you. Strangely, it spoke to me, a straight heterosexual male but then even Highsmith was surprised by the male response to her book. I agree partly on your analysis, I think it is clear, perhaps too clear, that Rooney is super straight but for me there were numerous times when Rooney rose to the demands of the story; for example the “I miss you” phone call to Carol late in the movie, the sparkle in her eye when she looked at Carol etc. But alas, you can’t forgive her for being straight.